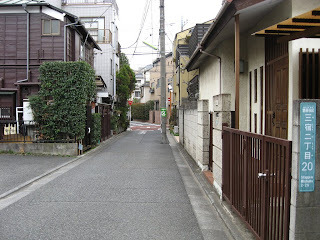 I woke up from bed laid on the tatami of my room to a house occupied by no one else but me. Except for the area around the study desk and where I normally place the futon, every little corner of my room is filled with stuff. Some of which are stuff I should have just thrown away. Since the garbage collector is strict on sorting garbage by how recyclable/combustible it is and has specific timings and days on collections for each particular type. I have to put out the specified garbage in a particular type of plastic bag at a certain time frame at the roadside. If not done correctly, they would just ignore it (I could tell from the other houses in the neighbourhood) or at least put a note that I am doing it wrong. I find it more convinent to just leave those around in my room and hopefully bring around to throwing those at the bins of the back alley of someone's store in the middle of the night. I look at the calendar clock that stuck out from the heaps of stuff everywhere in the room. I don't know how it accumulated to be like that. Oh, wait... Monday, February 14!? That means that today is St. Valentine's Day! Oh, what do I do... Kotomi might be expecting something from me and I'm not ready. I got out of my messy room to get ready. I know that the house is in a sorry state with dust and cobwebs everywhere, but I spend most of my time at school and work that I don't have the time to do it with a house this size and amount of dirt. My parents has been overseas for quite some time that, apart from myself and the photo albums in a room I rarely go in, I had forgotten how they look like. I got on the bicycle parked just next to the door. Just as I was closing the gate, I sighed as there are also weeds and tall grass for the garden, though small, surrounding the house and can be seen from the outside if anyone bothers. Animals like cats are often spotted around there, but none actually enter the house itself. The train station is located a short cycling distance away from home. Opposite of which is where I would work. The area around here spot very little changes since I was younger. Well, the shop owners or the store interior might have changed, people moving in and out, but other than that, nothing new around here except maybe that expensive-looking apartment my family will never be able to afford that is located about the same distance, but in the opposite direction, between the station and my house. Wonder who would move there. 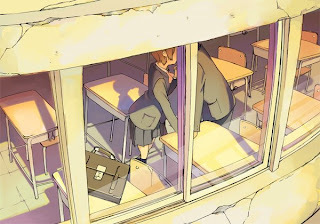 I will never forget what happened 10 days ago where my girlfriend, Kotomi Miyazawa, waited for me in my class after having a long lecture from the teachers about my grades as it is now reaching the end of the first school year. Normally at this late, when the sun starts to set, people would have already headed home and most club activities would be about to end. You can say that we are a couple as we both have the same interest and how we met by accident. As she is the smartest (and me being the lowest), she would willingly help me with the homework I was struggling with in a way I would understand, even when I ask her to repeat the same thing several times. She first asked me how it went and then I automatically said what had just happened as she patted my head. If you ask me now, I would not remember what they had told me. I was sick and tired of having my life being miserable. Midway through explaining what happened, Kotomi suddenly leaned toward me and kissed me on the lips, which I was not expecting. At that moment, my perception about life has changed completely. Not only was she the first person to kiss me, it now feels like I can't live on without her around. Back to the present time, I met her along the way to school not far away from the train station near the school. Many people around me were talking about today being Valentine's day. She seems to be able to read my mind on me not being prepared to give anything for her today and says that caring for someone one likes is more important than physical gifts. As we are in different classes, but in the same year, we departed and promised to meet at "the usual place" for lunch. 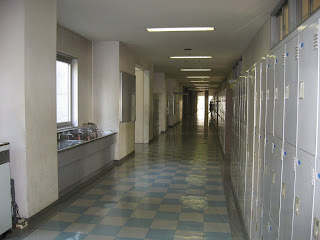 Come to think of it, it was this very corridor outside the front door of her class of 1-1 where I first met her. My best friend and classmate, Kenjiro Tanigawa, said that I am smiling broadly. I am? Speaking of him, I had known Kenjiro for quite a long time: Until I started working and going out with Kotomi, we would just hang out at the arcade downtown, or playing soccer/baseball with other people. It's really starting to get boring and monotonous. He's quite jealous that I got one of the most famous people in the school as girlfriend by just bumping into her unexpectedly. Seems that luck is turning around. After enduring lessons I don't understand most of, for what seemed like eternity, lunch break came at last. I went to meet Kotomi at the usual spot: at the rooftop. I overheard the teachers saying that students heading to the roof is actually allowed, but they deliberately placed ordinary-looking obstacles as it was the best place to store the unused equipment. I managed to reach the top of the stairs, opened the door there, and was immediately blinded by the bright light outside. What I saw was a large concrete open space surrounded by tall fencing and, beyond that, is nothing but forested hills and the big blue sky. I got out to see what the view is like in the direction of where I came from: it looked like a concrete shack with a door of which some water towers are positioned at the top and a fixed ladder at the side. That door has a glass window near the top that only allows light though. The area around there is the only place on the entire roof where there is shade from the sun, though the hill beyond that (of that school) is where the shade is from at certain times of the day. Except for satellites, lenses with ultra-mega optical zoom in those trees, passing planes & helicopters or just the stairs where I came from, nobody would be able to see what we do up here at all. Kotomi appeared shortly after with her lunch box after I took out mine. We sat down at the wall of the outside part of the staircase and have our lunch. When we finish our lunch, Kotomi would lie down on my lap to sleep. She would sometime talk to me. This happens everytime. The day passed by like the recent past few days. It's nothing really special, except that we were together with no one else in between. Because of that, money is not a problem as you don't need it to make someone happy. At work later that evening, the supervisor has assigned a project to me to make a prototype that would "unlimited granting of the deepest desires of whatever the holder wants except those with the intention to harm others" based on the design he gave me. I don't know what exactly he meant by that or how to fit into something as small as a wrist watch.